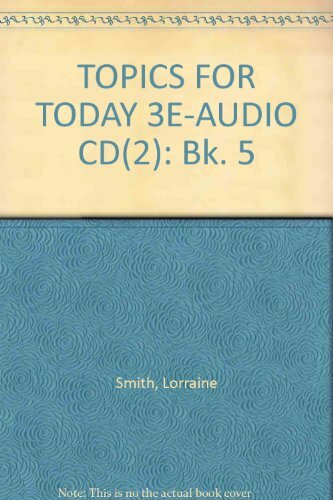 Audio CD contains the readings from the student text. Nancy Nici Mare received an MA in Applied Linguistics from CUNY Queens College, where she is an instructor at the English Language Institute. In addition to teaching all ESL skills, including reading, writing, speaking and listening, to students ranging from beginners to advanced, she has also served as a master teacher to many students in the practicum class in the MA Applied Linguistics program at QC. Recently, she developed an online advanced ESL writing course, which she subsequently taught to students in Vietnam. She is one of the two authors of the Reading for Today series that includes Themes, Insights, Issues, Concepts and Topics. Lorraine C. Smith has taught ESL for over 30 years. She has also taught TESOL Methods and Research courses at the graduate level. She has presented for 20 years at local, national, and international TESOL conferences. She holds Masters degrees in Linguistics and in TESOL, and earned her doctorate in Curriculum and Teaching at Teachers College Columbia University. In addition to coauthoring the Reading for Today series, she has written other ESL textbooks, journal articles and book chapters. She is currently the Associate Director of the English Language Institute at Queens College of the City University of New York.